Every year we have been doing this has got better and better for celtic-punk releases. As happy as we are that this is so it also means that we just cannot keep up with everything out there. We haven’t had the chance to review everything we received or heard so here is Part 1 of our 2016 Round Up where we catch up with some of the releases that we missed first time round. Here at 30492- LONDON CELTIC PUNKS blog we much prefer to do really detailed reviews but it has been impossible to keep up so here’s a few quick ones just to catch up and get 2016 out of the way. Each and every one are worthy of your time so go ahead and check them out. This time round we head to the America’s. Well four from the USA, one from Canada and one from Argentina! The Muckers are coming at you from Atlanta city in Georgia in the deep south of America. The city rose from the ashes of the Civil War to become a major city and later on in the decades following the Civil Rights Movement, during which the city earned a reputation as too busy to hate for it’s progressive views compared to other cities in the deep south, attained international prominence. The band take their name from the word ‘mucker’, a colloquialism meaning good friend used in main by the Irish and people from Yorkshire in England. The Muckers are Atlanta’s only Irish rock band with a massive following in the city among the Irish and their friends. A five-piece folk-rock band that as well as a strong emphasis on Irish music also blends in influences of gypsy music, sea shanties, country, rockabilly and anything else they can get their hands on. Eleven songs( and a mental hidden track!!) lasting well over forty minutes and what you get is exactly what is outlined above. Kicking off with a short accordion intro it soon launches into the superb ‘There is A Time’ with very much a bluegrass feel. Other notable songs here include both ‘Molly’ and ‘Eddie Connors’ which were originally recorded by a couple of The Muckers old bands but given a real lease of life here. A few self penned numbers and some standard Irish covers make up the rest of the album. A great knees up of an album with a grand sense of humour and infectiously good fun and well played. We have been long time fans of Texan band Nowherebound and while they may not be a celtic-punk band, or even a folk-punk band, but they are simply fantastic so deserve their spot here. If you can imagine a fast and heavy punk rock band that somehow manages to squeeze enough folk melodies into their songs then that’s them. A folk band in all but their music! Coming out of the same camp as punk bands like Social Distortion, Rancid, and Gaslight Anthem but with their cap tipped firmly in the direction of the Murphys or The Pogues. Much more straight up punk rock then their previous releases have been they toured Europe again in 2016, for the umpteenth time, but unfortunately have not made it to Blighty yet. From hard rock in-yer-face to pop punk melodies to raise-your-glass-and-sing-along-anthems Nowherebound that hit you in both the heart and the head. One of the better known of the North American celtic-punk bands Hoist The Colors come from the urban metropolis Los Angeles. They play a blend of punk rock, trad Irish, Americana and bluegrass that is as original as the city they call home. Now this is one album I would have loved to have gone into real detail about but it only landed in LCP Towers a few days ago so I am having to write this on just a handful of listens. And my first impression is the same as my tenth. It’s a fecking masterpiece! A wonderful LP that really shows the depth of the scene and the willingness to push the boundaries of what is celtic-punk. From first track ‘Little Rebel’ right through to ‘Something More Than This’ their is not a single bad track on Mourners. The title track was the first song released from the album and came with a superb video. Excellent use of the mandolin and the punchy punk rock keeps the toes a tapping. The second release from Mourners was ‘Rainier’ and for me was the album standout. Fast paced, punk rock that is accessible without being at all lame and again some excellent mando to keep the celtic among us happy. The rest of the album flows as smoothly as a pint of Guinness with the music uptempo and catchy as hell. Twelve songs and a running length of almost fifty minutes of non-stop quality celtic-punk that would surely be loved by anyone from you’re studs’n’spikes nephew to your auld Nanna. At the forefront of the Folk-Metal genre, though really it is in fact Celtic-Metal, Skiltron were formed in 2004 and come from Argentina. Now thats not so strange as it may appear as plenty of Celtic people emigrated there back in the day mostly Irish and Welsh. In 2016 they embarked on an epic European tour taking in an amazing nineteen countries in under two months. I missed their London date as it was my brothers wedding unfortunately but was absolutely stunning from other people told me. We have touched on metal a few times here and there seems to be a quite a scene growing out of what was once a handful of bands. We even have a London based celtic-metal band worth checking out Isamos (here). Legacy Of Blood is only eight songs long but as you can imagine it’s all quite epic and the songs take their time. The longest track is also my favourite, ‘Sawney Bean Clan’, about a clan of Scottish murderers who reportedly killed and ate over 1,000 people anywhere between the 13th and 16th centuries. It’s fast metal music with two bagpipes at times and the sound is quite incredible. The whole album is brilliant and if you like the sound of bagpipes then open your mind and get on board here. Fast as feck with rapid drumming and Scottish topics with clearly sung lyrics. No growling or grunting here!! I love it and seeing as how we have recently made friends with the people who put the gig on in London we hope to be bringing some more of this interesting scene to London soon. and listening to this corker of an EP that figures! WE caught their debut album in last years Round-Up’s here and if they keep releasing things in December then we’ll never get the chance to do a proper one! Anyhow that was bloody brilliant and this EP continues where they left off. Small Batch begins with ‘Hooligan Crew’ and its fast paced accordion led celtic-punk rock with some great dual vocals, which I always think works well. This is followed by ‘Blood, Sweat & Teeth’ and things speed up with a song that is significantly different from the opener but carries all the same elements. ‘Ships of November’ slows it down a tad and just as you think you’ve a lovely ballad coming along ‘Bang’ and we’re back into celtic-punk territory. ‘Slappywag’s’ appeared on that debut album and has been re-recorded here. It was the standout track then and it’s the standout track here as well. A ton more energy and a ton more oompf where you thought it would be impossible to add but they done it. Where the fiddle held court last time here it’s the mando and the accordion in charge in a brilliant song about the Bastards favourite boozer. The EP comes to an end with ‘Private Reserve’ and another beauty of a song. Less manic than the previous songs and perhaps the closest they come to sounding like the Dropkick’s. So what you get here are five songs that is over and done in a fast and frantic seventeen minutes. Every song here stands up on it’s own and the Bastards show they ape no one with their subtle changes of style. One of the many things that made their debut album stand out was their innovative style and they have lost none of that here. This isn’t just music for beer swillin’, foot stompin’, mosh pittin’ Canadians it’s music for beer swillin’, foot stompin’, mosh pittin’ wherever you come from! So ends Part 1 and we are sorry we weren’t able to give each album the full on London Celtic Punks treatment. Apologies to all the bands as each and every release deserved the full treatment. We are always looking for people to join the reviews team so don’t be shy. Anyhow more to come in Part 2 so check back after Christmas Day and catch up with some more of our favourite 2016 releases from around the world this time. If you don’t want to miss any of our posts then you can follow us by simply filling in your e-mail address in the box that is either below or to the left depending how you are viewing and you will receive every post to your in-box. NEW DROPKICK MURPHYS TRIBUTE ALBUM OUT TODAY! Take a Shot Records are proud to announce the release of their first major album as a record label. 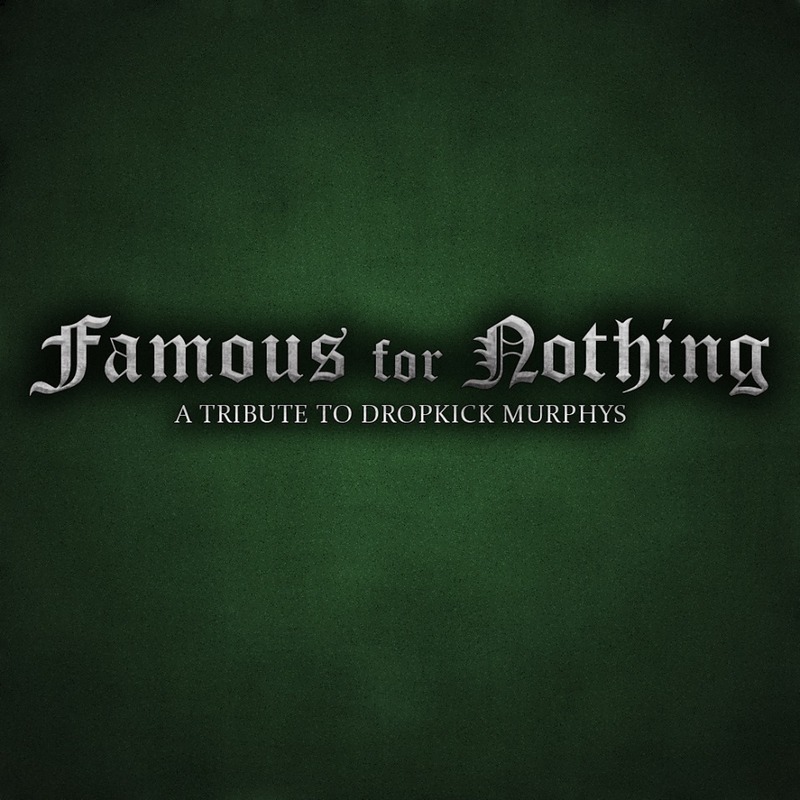 The idea for ‘Famous For Nothing: A Tribute to Dropkick Murphys’ came from Mike Franey (The Scally Cap Brats) and Chris Arias (Blackthorn Billy), and their love for the band. It was decided that the best way to pay tribute to the band that has influenced them so much was to recruit others who felt the same way and to make a tribute compilation and donate all the proceeds to The Claddagh Fund (Dropkick Murphys’ own charity). With the permission of Ken Casey and Dropkick Murphys, the compilation features eighteen bands from a wide array of places such as the United States, Sweden, Australia, Germany and Canada and 100% of the proceeds will be donated directly to the Claddagh Fund. Work on the release has been going on for over a year and it promises to deliver an eclectic mix of sounds from celtic-punk to street punk to folk to everything in between. Spanning the Murphys entire career, a wide array of songs have made the final roster for your listening pleasure. The full track listing is as follows and you can click on the individual band name for more information. Official release date is today Tuesday, February 24th, 2015. The Claddagh Fund was founded in 2009 by Ken Casey of the Dropkick Murphys. Ken, his bandmates and their families have supported charities throughout the history of the band. Understanding the power of their position to harness the passion and generosity of their fans, the Claddagh Fund was created to raise funds for and broaden our impact on worthy, underfunded non-profits that support the most vulnerable individuals in our communities. Utilizing a grassroots approach to fundraising, The Claddagh Fund supports community-based non-profits, with a focus on children and veterans organizations and programs that support alcohol and drug rehabilitation in cities across the country and around the world.